Vietnamese restaurant An Choi is slated to open this week at 85 Orchard Street between Broome and Grand streets. BXL East, a Belgian beer bar and restaurant, has opened at 210 East 51st Street between Second and Third avenues. Also in Midtown, Calvisius Caviar Lounge has opened at 58 East 58th Street between Madison and Park avenues. 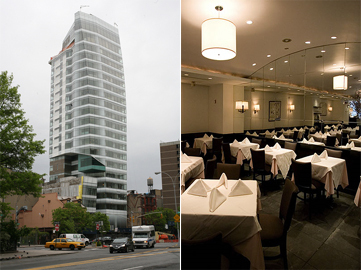 On the Upper East Side, restaurant Libertador is open at 1725 Second Avenue at 89th Street. Jerusalem Nights, a Middle Eastern restaurant, is open at 25-42 Steinway Street in Astoria. Cooper Square Hotel has opened its bar and lounge. Inven.tory has signed a lease for a new shop at 237 Lafayette Street. In Brooklyn, Vanessa Coffee Shop has opened at 510 Morgan Avenue in Greenpoint. The Brooklyn Standard Deli will open at the corner of Nassau Avenue and Jewel Street on April 1. A fast food restaurant is trying to take over the former Gage & Tollner space at 374 Fulton Street in Downtown Brooklyn. Anthos owners Michael Psilakis and Donatella Arpaia are branching out to open a new restaurant in downtown Miami.